This salad recipe is good with crab meat or shrimp (or you can use both). Corn adds sweetness to the salad, and the rice works as the base. You can cook it without rice if you wish, but I prefer it with rice, and herbs (dill and parsley, or just dill) are important. 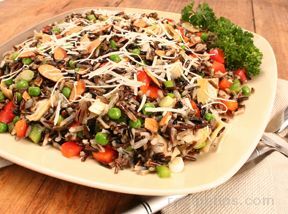 I love to cook this salad on a day to day basis or for a dinner party. (Just serve the salad in puff pastry baskets). The ingredients for this salad are simple and may be found in every pantry. Wash and boil carrot. Carrot has to be cooked, but not overcooked; drain and let it cool down. In a separate pot, wash and boil rice. Rice has to be boiled but not too soft and overcooked. When the rice is cooked, drain it and rinse with cold water. Boil eggs until hard boiled. When cooked (in 6-8 min) put in cold water to cool off. Peel and finely chop the onion (1/2 of it). Drain and rinse the corn (3/4 of a cup). When cooled, peel and finely chop the carrot. When rice is cooled off, mix it with the carrot, onion, and corn. Shell and chop the eggs. Wash and chop the dill. 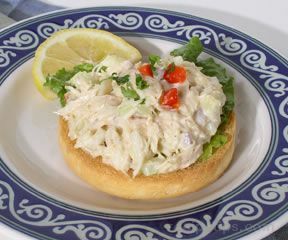 For the crab meat you can use real crab meat, simulated crab flakes, or even shrimp. (I use simulated crab meat.) 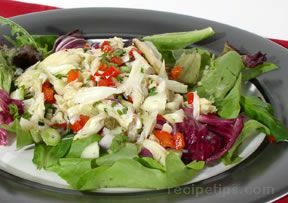 Cut the crab meat in mid-sized pieces and add to your salad. Add salt and pepper to your salad and mix all the ingredients well.